The DS18B20 communicates over a 1-Wire bus that by definition requires only one data line (and ground) for communication with a central microprocessor. It has an operating temperature range of -55°C to +125°C and is accurate to ±0.5°C over the range of -10°C to +85°C. In addition, the DS18B20 can derive power directly from the data line (“parasite power”), eliminating the need for an external power supply. Hi! Thank you so much for the code. I’ve used the exact one posted here and the same breadboard/circuit setup, but my serial monitor doesn’t display any temperature. What could be the problem? Please let me know! (Any help would be great as I am new to arduino.) Thanks so much. I’ve used the exact one posted here and the same breadboard/circuit setup, but my serial monitor doesn’t display any temperature. What could be the problem? Please let me know! 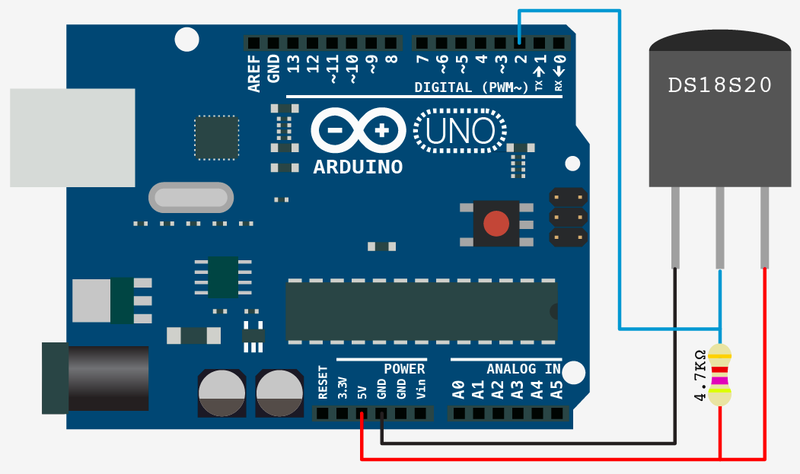 (Any help would be great as I am new to arduino.) Thanks so much! sorry for all the questions! What unit is the temperature in?